Atsushi offers Sashiko Stitching Workshop Online. You can learn the traditional Sashiko from the expert no matter where you live. The workshop content is similar to the Sashiko Stitching Workshop, which has been successfully offered in NYC and received so many positive reviews. In this online workshop, the participant will learn how to make Sashiko stitching more speedy, efficiently and beautifully. Atsushi will teach how to use the Sashiko needle and thimble individually by checking your hands throughout the Web Camera. 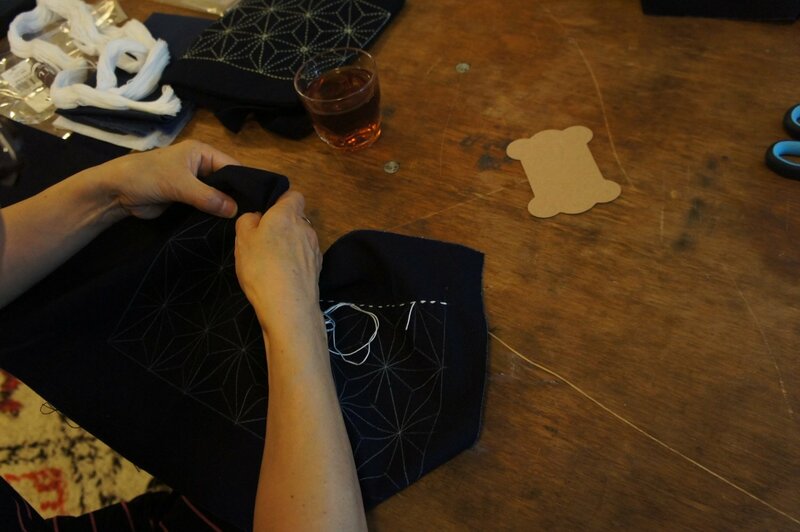 The participants also learn how to prepare the Sashiko fabric so you can continue the Sashiko journey. Required skill: A basic needlework skill & basic drawing skill (such as using a ruler precisely) are required. Please practice to thread the needle before the workshop start if you aren't comfortable with it (or have a threader ready). 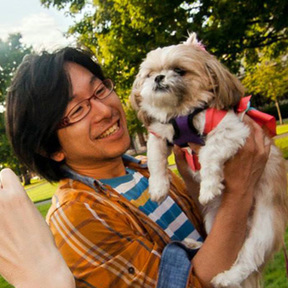 Required environment: A decent device with camera (Face-camera and Back Camera), such as a smartphone, tablet, or PC with a Web-Cam, connected to the Internet. Regarding the device, the newer the better, however, iPhone 5S worked okay in the previous Online Video Chat. Please contact me if you have a concern in your preparation with a device. For maximizing workshop experience, the participants need to show me the posture of stitching and actual stitching. A tripod or a smartphone stand would be necessary to have. A grid sheet (A sheet of Graph Paper) | I will send you a PDF if you would like to. This price includes all the material and the U.S. domestic shipping. For those who live outside of the U.S. please cover the discounted shipping of $15.00. As a part of the workshop, I will teach you how to draw the Asano-ha pattern on the fabric. The drawing isn't difficult, but If you would like me to draw the pattern for you, $10.00 of drawing fee will be applied separately. * If you have purchased our Sashiko Starter kit, you have most of the tools you need. Please contact me so I will give you the discount based on your need. Some might prefer to have another set of thimble and needle. I can add you more materials without the extra shipping fee. *Please read the agreement below to get the discounted price. The workshop below is designed for those who lives in the USA or Asia. If you live in Europe, please contact me so I may be able to add the day-time (EST) workshop, so you can join the workshop at night in your country. NA: Wednesday, for the USA residence & Japan residence. NA: or so, Monday, for the Non-USA residence | The earlier the better. Please contact for the detail for shipping. *The date above is subject to cancellation if the workshop doesn't have the minimum of 2 participants. In case of insufficient numbers of participants, I will reschedule you to the other possible dates. You will receive the final confirmation email 48 hours prior to the online workshop. Thank you for your understanding. In order to register yourself for the Online Sashiko Workshop with the discounted price, please agree with the list below. If you are not comfortable with the list, please wait for the update when I can offer the regular workshop without the agreement below. Also, you may consider to have the private online workshop for $490.00 (Everything Included). I will introduce how the workshop proceed after the workshop on my website. Please provide me some photos that you may take during or after the workshop. Please understand the risk of "cancellation" due to the equipment failure or insufficient Internet connection, and Atsushi's personal condition as a stay-at-home father. Please make sure that you have the best tools available for enjoying the live streaming. Old or insufficient tools, such as an old iPhone, may stress you because of the quality of video. I will not be able to control it on your side. It is participants' responsibility to follow the emails Atsushi send out and follow the direction. 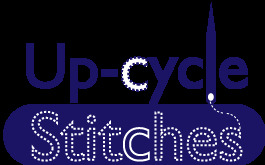 I will follow-up, and will provide the support until I teach you how to use thimble and needle throughly. Since this workshop includes a lot of materials delivered to you in prior to the actual workshop, we do not accept the cancellation and refund. Once you arrange the workshop date, please respect us and the others who join the workshop on the same day. In extreme case scenario, I will accept the reschedule of the appointment if the notification is made before 48 hours of actual workshop starting time. If you need to reschedule the workshop within 48 hours of the workshop starting time, the reschedule fee of $30.00 will be applied. Any case scenarios of workshop cancellations or errors in our preparation, you will be rescheduled to the future Online Workshop without the extra fee. It is very challenging to teach the workshop I do face to face via Internet. If you can make a trip to NYC when I offer the workshop in NYC, please consider to take the Sashiko Stitching Workshop (Core & Basic). This small-group, face to face, hands on hands workshop is the workshop Atsushi is confident to satisfy the participants. Learn Sashiko with Videos at your pace. I receive requests for learning Sashiko from the Video. For now, I do not have enough time & money to make 3 hours of comprehensive and well-edited videos to share the similar experience. The better filming equipment would be must to have for this to happen. I will work on creating the videos, and once I am ready, I will let you know. Please subscribe our newsletter for more updates.